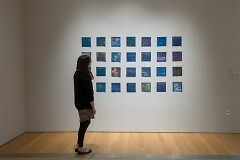 For more information about the Grand Rapids Art Museum, visit artmuseumgr.org. The Grand Rapids Art Museum (GRAM) announced today that the next installment of its Michigan Artist Series will be opening on October 27. Dylan Miner: Water is Sacred // Trees are Relatives will be on view at the Museum through March 3, 2019, and features the work of East-Lansing based Wiisaakodewinini (Métis) artist and activist Dylan Miner. Miner debuts new work in Water is Sacred // Trees are Relatives that focuses on the natural world, particularly the Great Lakes region. He investigates the important historical and current issues surrounding four primary natural elements: trees, water, minerals, and sky, and the centrality of these elements to our shared lives in the Great Lakes watershed. For this exhibition, Miner has created a suite of paintings he refers to as “oil field” paintings, crafted from bitumen, commercial felt, and pine panels. In these tactile works, Miner references three subsequent waves of regional resource extraction. The paintings’ felt surfaces reference the harvesting of beavers to create felt hats, their pine supports allude to the overharvesting and clear-cutting of timber, and the bitumen—a byproduct created from the distillation of petroleum—links us to contemporary, and historic, issues around mineral extraction. Water is Sacred // Trees are Relatives features a series of ethereal images of cloudy skies, shimmering water surfaces, and dense forests created using the cyanotype photographic process. The cyanotypes are printed on fabric and hung from copper rods, a reference to the sacred and profound role copper performs for many Indigenous cultures. "Cyanotype as a process was invented 176 years ago in 1842, the year that The Treaty of LaPointe was signed between the federal government and tribes in Michigan, which ceded much of the Upper Peninsula," said Artist Dylan Miner. 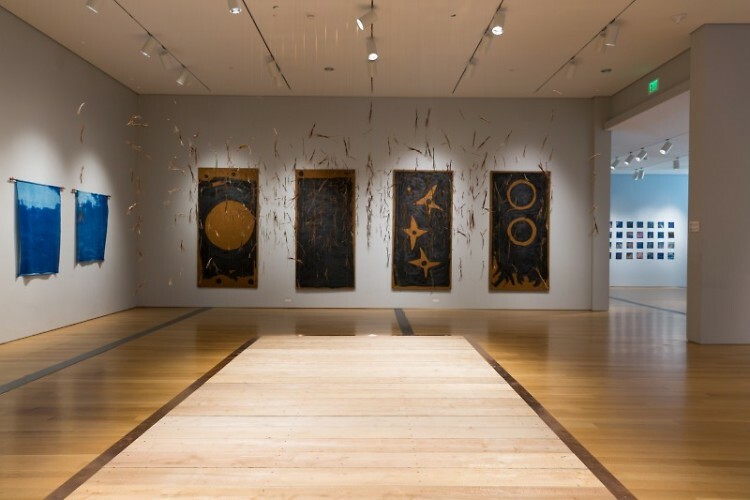 "With my work at the Grand Rapids Art Museum, I think about the relationship between the spirit and history of a place, and the way that these are implicated in the world we’re living in now." The exhibition includes two installation works constructed from old-growth white pine, pine needles, and copper as well as a series of 176 small cyanotype paintings. In conjunction with Water is Sacred // Trees are Relatives, Miner organized a series of workshops for Native youth in collaboration with two younger emerging Indigenous artists, Shane McSauby and Kay Mayer. A central component of these workshops is conversation about ancestral histories, as well as discussions about the Land, the Water, and the Sky. The youth collaborators, who ranged from middle school to university students, learned how to create their own cyanotype prints. The youth-created artworks will also be exhibited at GRAM. Miner is the Director of American Indian and Indigenous Studies and Associate Professor in the Arts and Humanities at Michigan State University. He has exhibited his work internationally in solo and group exhibitions and been artist-in-residence or visiting artist at institutions such as the School of the Art Institute of Chicago, École supérieure des beaux-arts in Nantes, France, Klondike Institute of Art and Culture, Rabbit Island, Santa Fe Art Institute, and numerous universities, art schools, and low-residency MFA programs. In 2010, he was awarded an Artist Leadership Fellowship through the National Museum of the American Indian (Smithsonian Institution). GRAM Members are invited to the Member Exhibition Opening of Water is Sacred // Trees are Relatives this Friday, Oct 26 at 7 pm. Complementing the exhibition, GRAM Members and the public can participate in several related programming and events, including Drop-in Tours, Adult Workshops, and Drop-in Studio. Lead support for this exhibition is generously provided by Barnes & Thornburg LLP, with additional support from Beusse & Porter Family Foundation, The Jury Foundation, and Steelcase Inc.